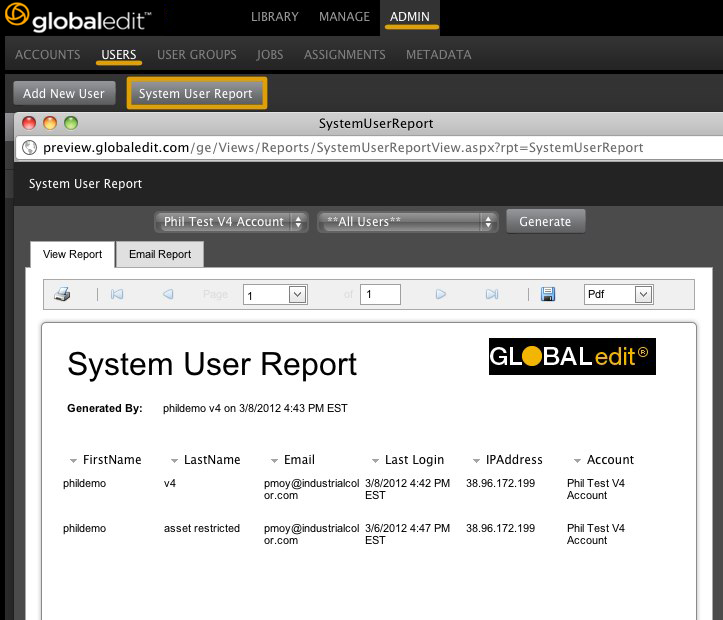 globaledit provides tracking and reporting tools to better monitor account activity. All system reports can be printed or exported as either a PDF, TXT file, or in CSV format. Additionally, you can select the email report tab to send the generated report to email recipients. Navigate to MANAGE > REPORTS and select Download History. Select a specific account or select all accounts and the timeframe for which you would like to generate a report. Click the Generate button to generate the report. Navigate to MANAGE > REPORTS and select Download History by User. Select a specific account or select all accounts and the timeframe for which you would like to generate a report. Click the Generate button to generate the report. This report reflects the User Downloads for the username you are currently logged in as. Keep in mind any downloads made by a recipient of a Lightbox you shared will show up on your report as "guest of user". Navigate to MANAGE > REPORTS and select Ingested File History. Select a specific account or select all accounts and the timeframe for which you would like to generate a report. Click the Generate button to generate the report. Navigate to MANAGE > REPORTS and select Login Report. Select a specific account or select all accounts and the timeframe for which you would like to generate a report. Click the Generate button to generate the report. This report will return a list of users per account, the method they used to log in (basic or 2-step), their last login date, and their Client IP address. Click ADMIN > USERS > SYSTEM USER REPORT. This will display a detail of a User's most recent login. Select an account and user and click GENERATE. You can view the report in PDF form online, print it, or email the report to a recipient.